Study 1 confirmed the construct validity of the IH scale and demonstrated relations with several other psychological constructs. Positive correlations were found with openness, epistemic curiosity, existential quest, and need for cognition, and negative correlations with dogmatism, intolerance of ambiguity, and self-righteousness. IH was not correlated with narcissism and social vigilantism. Studies 2 and 3 showed that IH was unrelated to religiosity and political affiliation. Note: this should, of course, not be taken as evidence for epistemic equivalence of various religious or political positions. This study did not examine whether intellectually humble people possess more accurate, nuanced, and useful knowledge than less intellectually humble people. While unrelated to religious or political affiliations, IH did predict how people react to other people’s beliefs. People high in IH preferred balance (vs. extreme) perspectives, were less inclined to judge others on their views, and were more tolerant to other people who changed their views. Finally, study 4 showed that people high in IH were better at distinguishing weak from strong arguments. 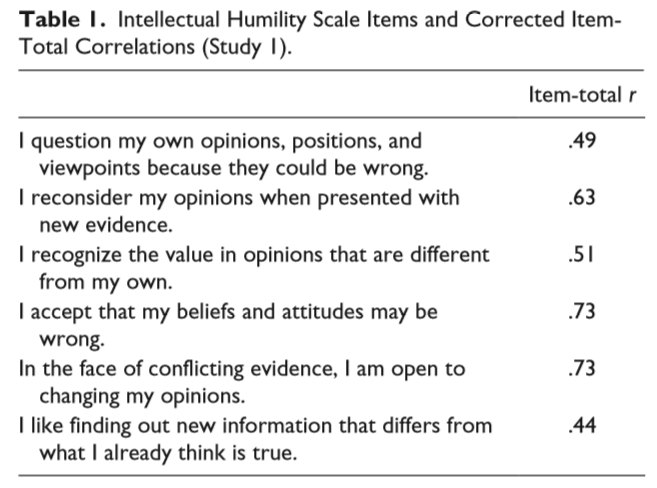 Update re "Intellectual humility unrelated to religiosity"
[...] the sample was selected to include people who identified as religious (n = 94) and not religious (n = 94) in response to the question, “Do you consider yourself to be a religious person?” (yes, no). Most of the sample identified their religious affiliation as Christian (n = 125); atheist, agnostic, or none (n = 39); or Jewish (n = 14), with smaller numbers indicating Muslim (n = 2), Buddhist (n = 2), and other (n = 6). This surprised me. How is it possible that the sample consisted of 94 religious and 94 not religious people yet only 39 identified as atheist/agnostic/none and 141 identified as religiously affiliated. I contacted the lead author who explained to me that many of the people in the sample who described themselves as "Christian" indicated that they were not religious because, while holding religious beliefs, they did not engage in religious behaviors. To hold religious beliefs but view oneself as not religious seems odd to me. So, what was the statement IH is unrelated to religiosity based on? It is based on the correlation between IH and scores on the so-called DUREL scale, a scale which assesses three primary dimensions of religiosity: organizational religious activity (attending church or other religious meetings), non-organizational religious activity (prayer, meditation, or studying religious texts), and intrinsic religiosity (being guided by one’s religion in daily life). Conclusion: While the phrase "Intellectual humility is unrelated to religiosity" suggests (at least to me) that religious people and non-religious people (in the sense of being atheist/agnostic/none) are equally intellectually humble, the study does not demonstrate this.